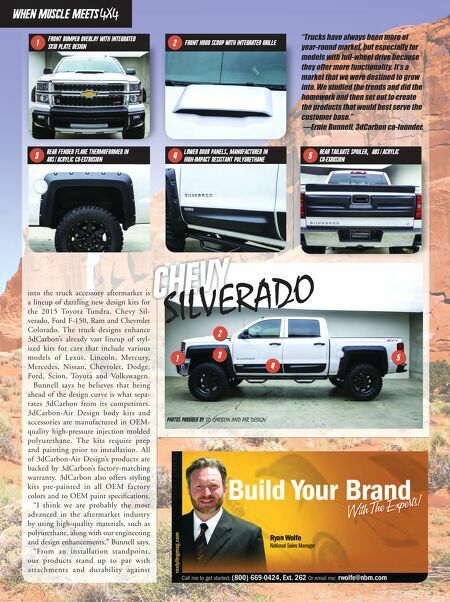 restylingmag.com January 2015 | Restyling & tRuck AccessoRies 21 into the truck accessory aftermarket is a lineup of dazzling new design kits for the 2015 Toyota Tundra, Chevy Sil- verado, Ford F-150, Ram and Chevrolet Colorado. The truck designs enhance 3dCarbon's already vast lineup of styl- ized kits for cars that include various models of Lexus, Lincoln, Mercury, Mercedes, Nissan, Chevrolet, Dodge, Ford, Scion, Toyota and Volkswagen. Bunnell says he believes that being ahead of the design curve is what sepa- rates 3dCarbon from its competitors. 3dCarbon-Air Design body kits and accessories are manufactured in OEM- quality high-pressure injection molded polyurethane. The kits require prep and painting prior to installation. All of 3dCarbon-Air Design's products are backed by 3dCarbon's factory-matching warranty. 3dCarbon also offers styling kits pre-painted in all OEM factory colors and to OEM paint specifications. 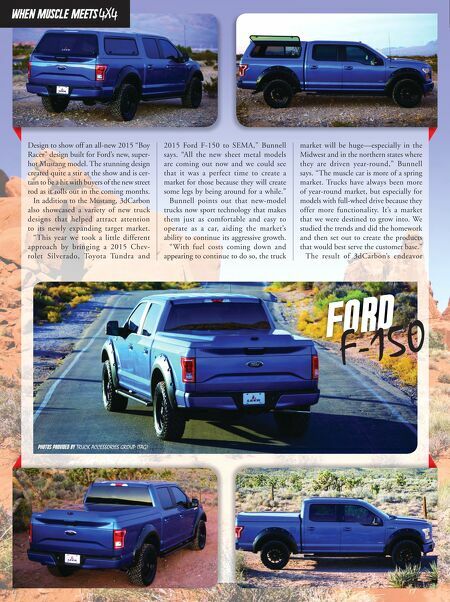 "I think we are probably the most advanced in the aftermarket industry by using high-quality materials, such as polyurethane, along with our engineering and design enhancements," Bunnell says. "From an installation standpoint, our products stand up to par with attachments and durability against when muscle meets 4X4 FRONT BUMPER OVERLAY WITH INTEGRATED SKID PLATE DESIGN REAR FENDER FLARE THERMOFORMED IN ABS ACRYLIC CO- EXTRUSION FRONT HOOD SCOOP WITH INTEGRATED GRILLE PHOTO PROVIDED BY XXXXXXX 1 1 2 2 3 3 4 5 4 5 PHOTOS PROVIDED BY 3D CARBON AND AIR DESIGN chevy SILVERADO LOWER DOOR PANELS.MANUFACTURED IN HIGH- IMPACT RESISTANT POLYURETHANE REAR TAILGATE SPOILER. ABS.ACRYLIC CO- EXRUSION , , "Trucks have always been more of year-round market, but especially for models with full-wheel drive because they offer more functionality. It's a market that we were destined to grow into. We studied the trends and did the homework and then set out to create the products that would best serve the customer base." —Ernie Bunnell, 3dCarbon co-founder.